A former aide to Russian President Vladimir Putin, who was found dead in a US hotel four months ago, died of head injuries, US coroners say. Mikhail Lesin, 57, also had blunt force injuries to the neck, torso, arms and legs, Washington DC's chief medical examiner said, without concluding how the injuries had been sustained. 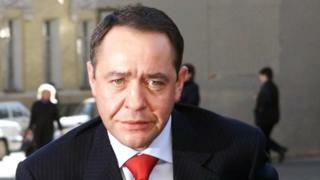 Russian media had reported Lesin's death as a suspected heart attack. He was one of the most influential figures on the Russian media scene. A former Russian press minister and one-time head of the powerful Gazprom-Media Holding group, Lesin was found dead on 5 November 2015 in the Dupont Circle Hotel. It is unclear why he was in Washington but several family members were resident in the US and had business interests there. He worked as an aide to the presidency between 2004 and 2009 and was instrumental in the creation of Russia's state-funded international broadcaster RT (formerly known as Russia Today). The BBC's Steve Rosenberg in Moscow says that for years Mikhail Lesin was the mastermind behind the Kremlin's wholesale takeover of the Russian media landscape after Mr Putin became president. As Russian press minister and media adviser to the president, he earned the nickname The Bulldozer for the way in which he crushed all Kremlin critics in his path, our correspondent says. He adds that there was no public falling-out with the Kremlin. After Lesin's death, President Putin spoke of his "enormous contribution" to Russian media. The chief medical examiner provided no further details from the post-mortem examination. But police spokesman Dustin Sternbeck said the case remained under investigation, the Washington Post reports. He declined to say whether the post-mortem examination results meant a crime might have been committed. The New York Times reported that Lesin's injuries were the result of "some sort of altercation" that happened before he returned to his hotel. The Russian embassy in Washington told the BBC that it became aware of the injuries sustained by Lesin only on Thursday, when the medical examiner's report was released. Press Secretary Yuri Melnik criticised the lack of communication by US authorities, saying Russia had made repeated requests for updates on the investigation but very few facts had been given. Russian foreign ministry spokeswoman Maria Zakharova said Moscow expected "clarification from Washington and relevant official data on the progress of the investigation". Various theories are swirling in the media about what happened to Lesin now it has it emerged that he suffered multiple injuries. Back in November Russian media, quoting his family, said he had suffered a heart attack. Last November the UK's Daily Mail raised the possibility that the FBI could have faked Lesin's death in order to give him witness protection - as a valuable information source, since he had long been a Kremlin insider. It also quoted Mikhail Seslavinsky, head of Russian media regulator Rospechat, as saying Lesin had appeared happy and healthy a month earlier. He added that Lesin had had complicated surgery for a spinal injury, but was now doing sports. There are unconfirmed reports that Lesin had had a dispute with financier Yuri Kovalchuk, a longstanding friend of Mr Putin. A Russian forensic expert quoted by Lenta.ru website (in Russian), Alexander Aulov, said Lesin's injuries were consistent with a severe beating, not an accident or the result of convulsions. In 2014, Mississippi Senator Roger Wicker called for an investigation into Lesin over possible money laundering, saying he had moved his family to the US and bought several multi-million dollar properties in California. Some of the properties reported to have been bought by companies connected to the family include, according to the LA Times, a house in the Pacific Palisades for almost $4m and a house in Beverley Hills bought in 2011 for almost $14m. His son Anton Lessine has produced several high-profile Hollywood films, the Business Insider website reports, featuring stars like Brad Pitt, Woody Allen and Arnold Schwarzenegger. Sen Wicker said Lesin's fortune had raised "serious questions" and he asked how a former civil servant could have bought and maintained expensive property. He also expressed concern that the purchase might have involved people and groups on a US sanctions list. Lesin's Gazprom-Media group is owned by Gazprombank which, in turn, has links to Bank Rossiya, described by the the EU and US authorities as "the personal bank" of top Russian officials. Bank Rossiya is under EU-US sanctions, as is the bank's biggest shareholder Yuri Kovalchuk. He is a longstanding close aide to President Putin. Lesin made his name in PR and advertising in the 1990s, founding advertising agency Video International or Vi - still one of Russia's biggest. He went on to became head of the state news agency RIA Novosti and in 1996 he devised the advertising campaign that helped then President Boris Yeltsin win re-election.